I am away on the 14th so there will be no training. Back to normal the following week. Dates for your diary - Click here! Includes seminars, Christmas training dates, club night out, grading info. The Christmas night out has finally been organised! It is booked for Tuesday 19th December, 8.00pm at the Ancient Raj in Frimley High Street. For those who don't know the restaurant it is slightly more expensive than your average indian meal, (still very avordable though) but the few extra pounds you pay are well worth it, trust me! Partners / friends are welcome too! I am going to put a small amount of money from the club towards the bill (probably about £30, depending on numbers), and we can then split the rest. If you would like to come please let me know and give me a deposit of £5 per person asap (the deposit comes off the final bill). I hope you all can make it!!! 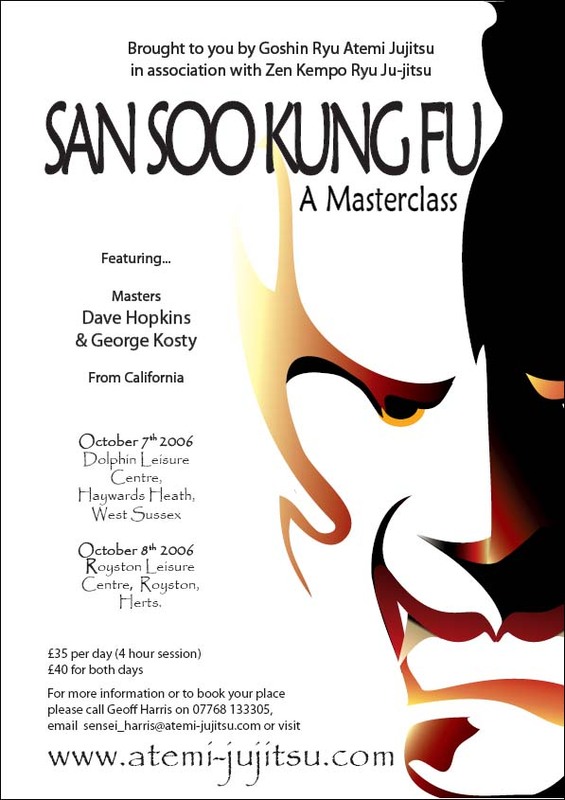 Masters Dave Hopkins & George Kosty are coming over from California to give a weekend seminar. All those that have seen these guys will vouch that this is one NOT TO BE MISSED!!!! See me for tickets or for more information click here. I hope you all have a great Christmas and New Year and will see you all in January. I would like to congratulate all students who entered the grading yesterday. Everyone put a lot of effort into preparing for it and this showed on the day. Spirit and Kiai were excellent from you all and I am very proud. I'm sure this high standard will continue for all future gradings. Well done! The next grading will be on Sunday 2nd October, starting at 11am at the Frimley Martial Arts Centre. You will need a current licence to enter. For those needing reminders of the groundwork sections you will find video clips and pictures up to orange belt on the Syllabus Page (Clips are also on the Videos page). You can print a copy of the Syllabus here. Sensei Kevin McKane from Tatsumaki Ju Jitsu Kai is holding his annual seminar to raise money for the charity Parity. I think the day will start around 11am and usually goes on until everyone has had enough! As well as all the clubs from within our group, there will be guest instructors from a variety of styles. Hopefully former kickboxing and sport Jitsu world champion Gary Turner will be teaching, among others. Let's see if our club can put on a good turn out for our first public event since Sen Ran Ju Jitsu Kai opened! Tickets are £15 and all money raised goes to charity. This is always a great evening. Held at Camberley Working men's club, there's cheap booze, a live band, raffle and of course Sensei Kevin's dancing!!! Put this together with a bar extension and it's something you just can't miss. Again all money raised goes to charity. Tickets are a bargain too at £5. Friends and family welcome. There will be no training on Monday 2nd May or Monday 29th May due to the Bank Holidays. All other lessons will be going ahead as usual. Everyone who took part in the Scuba Diving night thoroughly enjoyed themselves. You can see some pictures from the evening on the Social Events page. The Discover Scuba Diving date has been confirmed as Friday 15th April. The cost is £25 per person. If you would like to attend please can you get your medicals and money in ASAP. The very latest will be Friday 8th April. Thanks. It is with deep sorrow and regret that we have to announce the death of Sensei Clive Langley, 1st.Dan Go-no-Sen Ryu Ju Jitsu. Clive Sensei was a good man and a fine practitioner of the Martial Arts. He will be sorely missed by those who knew him. All Ju Jitsuka extend their sympathies and sincere commiserations to Jim, his father; and to Sharon, his partner. Sen Ran's opening night was a great success and I'd like to thank everyone who supported the club. Pictures of the night will be posted soon in the gallery! SJJK is organising a social Scuba Diving evening. No experience is necessary as the event is an official PADI (Proffesional Association of Diving Instructors) program designed for those who want a taster in scuba diving and will cost £25 per person. It will be run on a Friday evening and you will get a half hour in the class room learning the basics and then an hour in a swimming pool. Followed by the pub! All the teachers are fully qualified PADI instructors and the groups will be no more than 4 students to 1 instructor. The event is open to anyone including family and friends. If you would like to sign up or find out more information please contact me. SJJK's Opening Night - Mon 21st Feb! Sjjk Will be holding it's Opening Night on Monday 21st February. Everyone is welcome and this training session will be FREE. If you've never done Ju Jitsu, don't worry come along and give it a try, you will be most welcome.